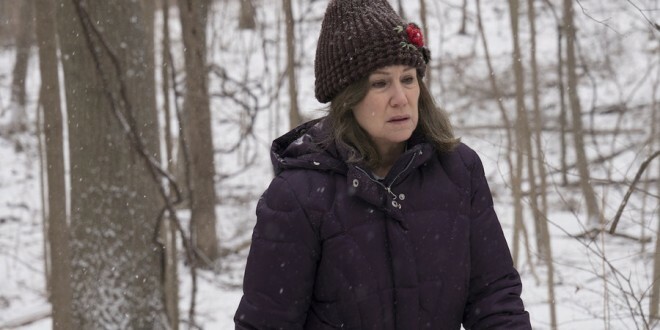 Periodically, it happens; almost instantly, acknowledging the worthiness of the movie, but wishing to remove oneself from the onslaught of massive, bludgeoning depression; “Diane” marvelously depicted by Mary Kay Place is a middle-aged depressive, her focus on others to the exclusion of her own issues, is devouring her sanity; she is a list maker, visiting and feeding the sick, working in a soup kitchen; stuck with a drug-addled son, “Brian” (Jake Lacy), a dying cousin “Donna” (Deirdre O’Connell); meandering from one injured family to another, her only serenity (and the viewers) is in the silence of her car, journeying from one ailing, aching, household to another. Director/writer Kent Jones has seemingly culled from experience these all too real characters; possibly what pains us, is that we recognize them; flawed, persecuted, plagued with guilt over past errors; religiosity pulsates at “Diane’s” core. Is penance, whether earned or deserved, ever resolved in forgiveness? How many “rights” to right one wrong? “Diane’s” hopeless, gloomy futility, essentially leaves one saddened by its veracity, validity.